One of the 19 children of the Duggar family, Jill Michelle Duggar Dillard, a.k.a. Jill Duggar, is a reality TV star and a TV personality. She is currently married to her husband Derick Dillard, and she has an estimated net worth of $400,000. Born on 17th May 1991, the 26-year-old is also the mother of two children. On TV, she is best known for her appearance in reality TV shows 19 Kids and Counting from 2008 to 2015, and Jill & Jesse: Counting On from 2015 to 2017. The TV shows also star her parents Jim Bob Duggar and Michelle Duggar, and her other family members. Let's find out more about her net worth, earnings, and her properties inclusive of her husband's. As we have already mentioned above, Duggar has an estimated net worth of $400,000. Her source of income is obviously her career in reality TV. She is the breadwinner as sources claim that her husband Dillard who previously worked at a retail chain made around $44,000 but since he has gotten married to Jill, he has not gotten involved in any kind of employment. Happy birthday sweetie @derickdillard I am so grateful to God for you! I pray that in this next year (last one in your 20’s!) you will draw closer to God every day! Thank you for leading our family and caring for each of us so well! You’re the best! I love you!! Recently, he has been dealing with a lot of criticism for openly begging money with his fans through social media as a fundraiser. Previously, a site he opened as a fundraiser was closed because they found it inappropriate. Moreover, currently, people who visit their official site are asked to make a donation of $15 every month. This is a good way to prevent humiliation but fans are agitated by it. Moreover, Dillard is a very controversial person on social media. A few years back, he even threw a 16-year-old transgender girl under the bus for being transgender. His followers are not a huge fan of his attitude and we are sure that his Duggar in-laws would also love him to change this behavior of his. 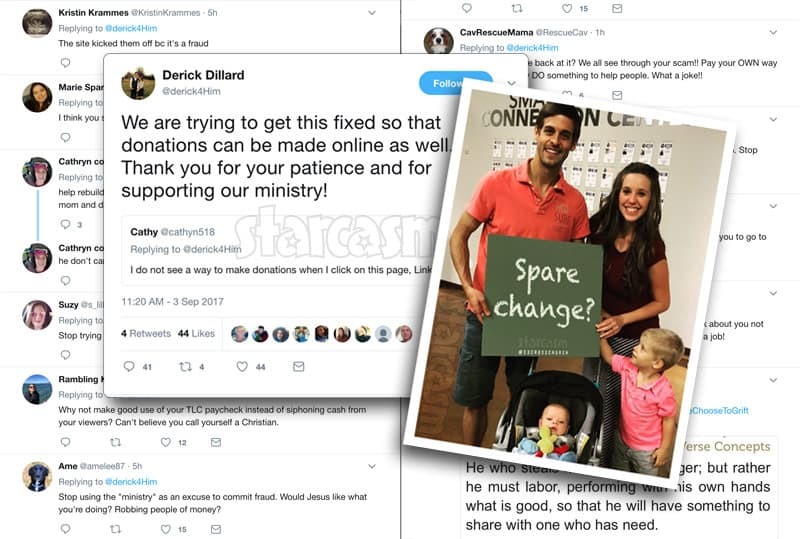 Dillard should really get a job because there are people out there who need donations more than he does and it is irrelevant for him to ask for donations when he does not need it. Jill Duggar and husband Derick Dillard's properties. Jill and Derick, previously, used to live in the Duggar's 7000 sq ft mansion where they moved in 2006. The mansion is grand and perfect for the massive family. It featurs playroom for kids, giant living room for the family to spend time and much more. Later on, they started living in a large house gifted by the Duggar parents. They previously used to live in the house but, later, gifted it to her favorite daughter after they moved to their new house. In 2017, the pair officially moved out of the house and started living in another smaller house located in Central America. The house is way smaller but they have to pay rent for the house. Fans got very curious about the sudden move and many started questioning them. Derick even replied a fan saying that the rent was much cheaper. @derickmdillard I am a big supporter. I was wondering why you guys left your GORGEOUS mansion to move closer to college when it's only 20 miles away. That's not much of a drive and the kids probably loved the space and yard. Just curious. God bless. Although Derick replied cleverly, fans could sense something very fishy about him. Apart from this, there is very little known when it comes to the pair's real estate, automobiles, and other assets.